Its so hard waiting for professional pictures. But its nice she sent along this teaser photo. 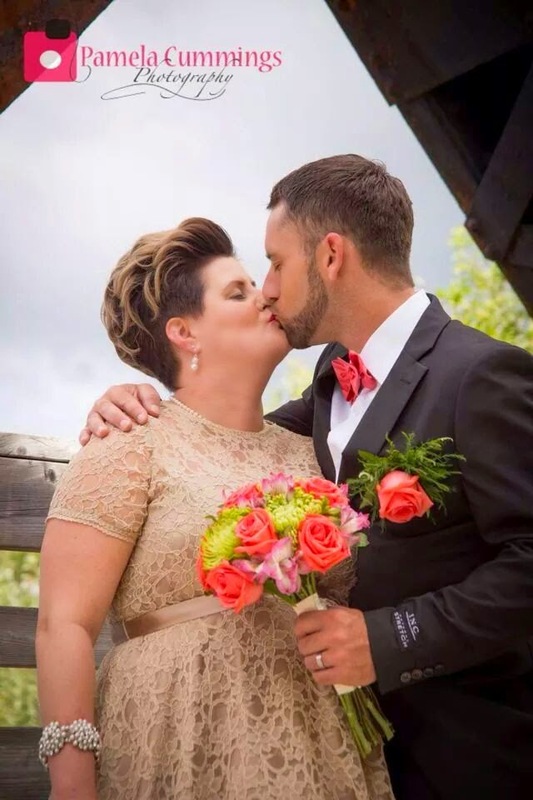 Congrats Patience and Brian on your one week anniversary. 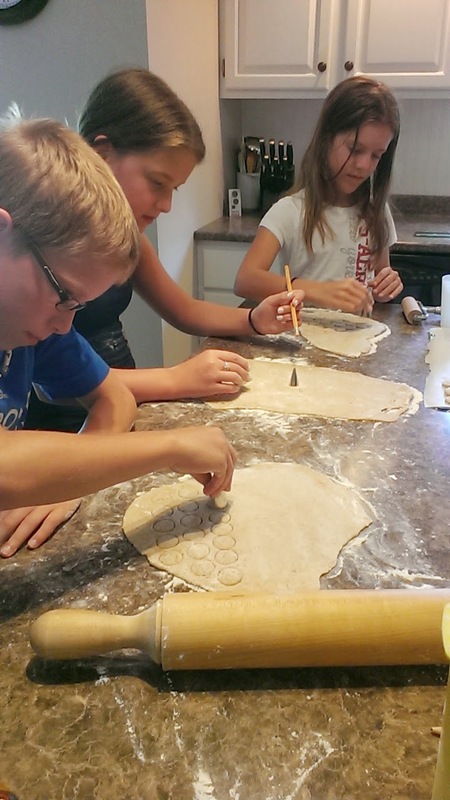 I loved making these cookies. 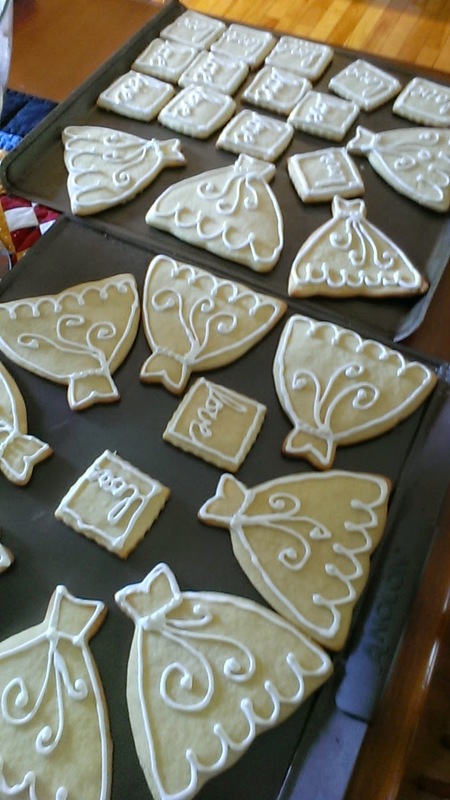 I have a favorite sugar cookie recipe called Signature Sugar Cookies. I made two batches Out of one batch, I made 12 wedding dresses. Out of the other batch came 40 love cookies. The love cookies were put on the desert table. 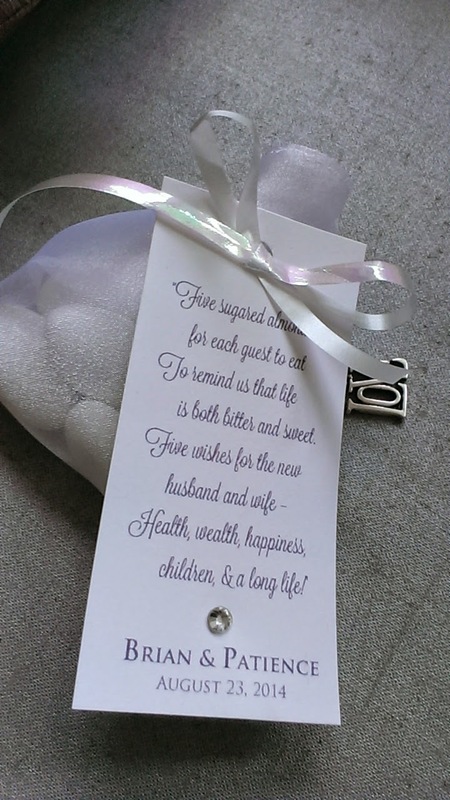 The bride dresses were put in cellophane bags and tied with a ribbon. The kids took them home. Then it came time to decorate. The afternoon before the wedding, with advice and suggestions from my friend Willa, my sister and I hung toule, swagged pearls. Bunches of fresh Nova Scotia ivy dropped from the bows. It was just perfect. One day last month the triplets helped me make wedding fans. 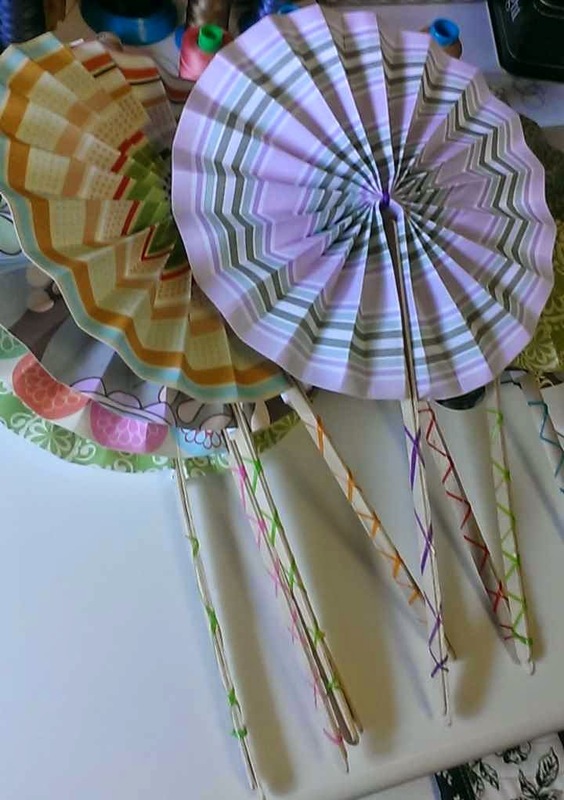 Between the four of us, we got all 40 of the fans cut out and scored for easy folding and finishing. 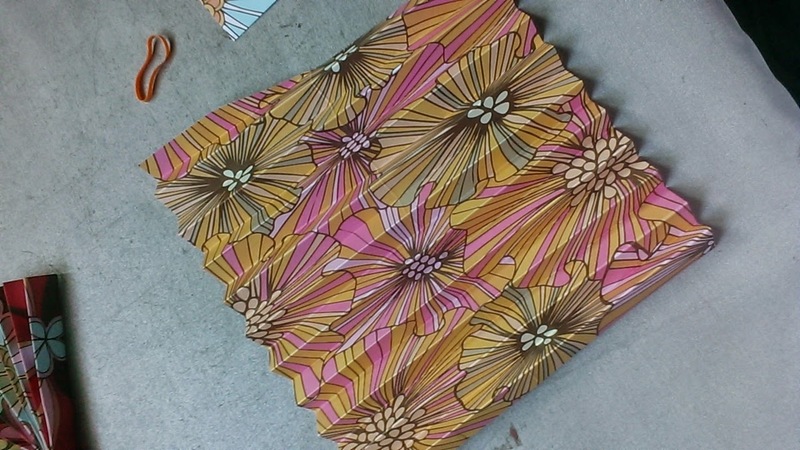 We used heavier weight scrapbook paper. 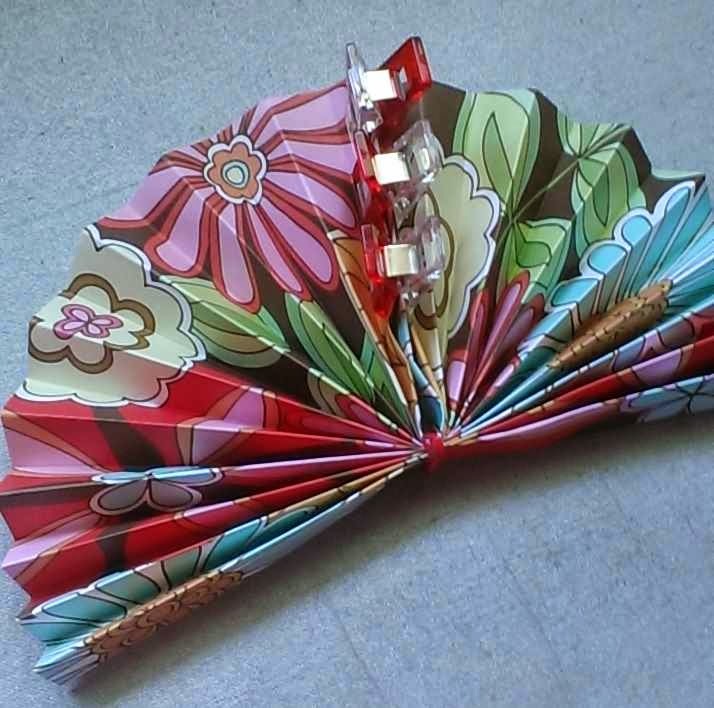 To finish the fans, a small elastic was used to hold the fan folded paper. Blue glue was used to join the two sides of the now accordion folded fan together. After that glue dried, coffee sticks were added to the bottom of each side of the fan with the same blue glue. 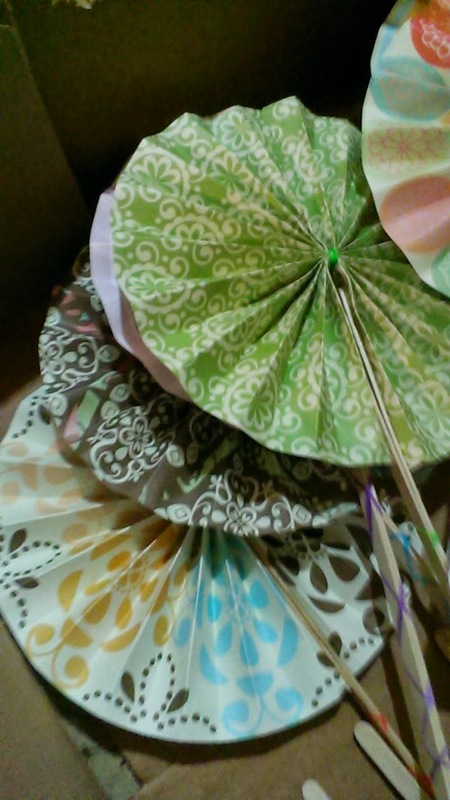 As you can see I'm using my nice clover clips to hold the sticks on the fan while the glue dries. After the glue is all dried, I bring the two coffee sticks together and put an elastic on the handle to hold it in place. I like to play with the elastic and make like ballerina ribbons. So cute. The weather on the day of the wedding was beautiful and warm. It was warm in the church and warm at our back yard garden party. We loved that. The fans were really appreciated and put to good use. A good idea. For her cake, my daughter decided she wanted cupcakes. But she also wanted to have a photo of her and her new husband cutting the cake. So the solution was to make both. 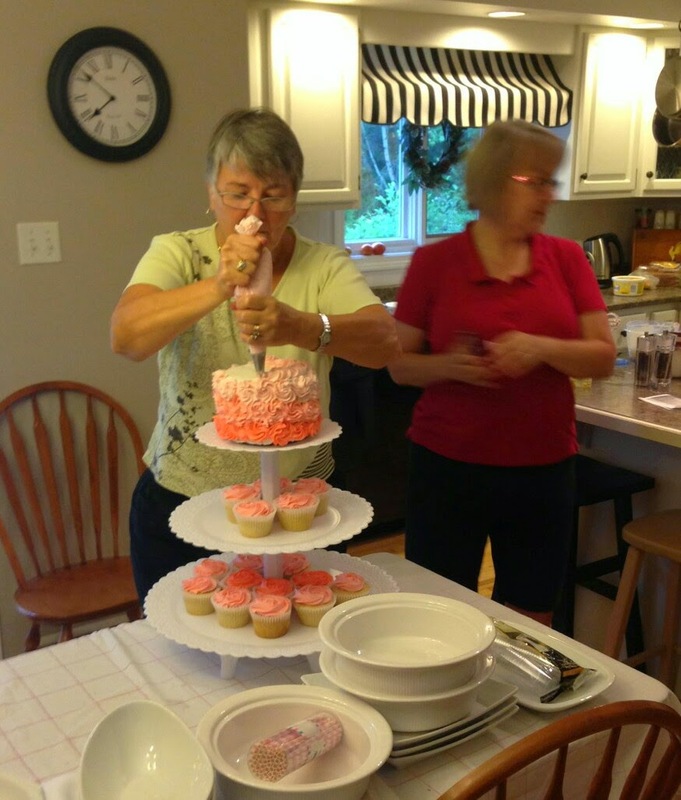 A small cake for cutting and cupcakes for sharing. 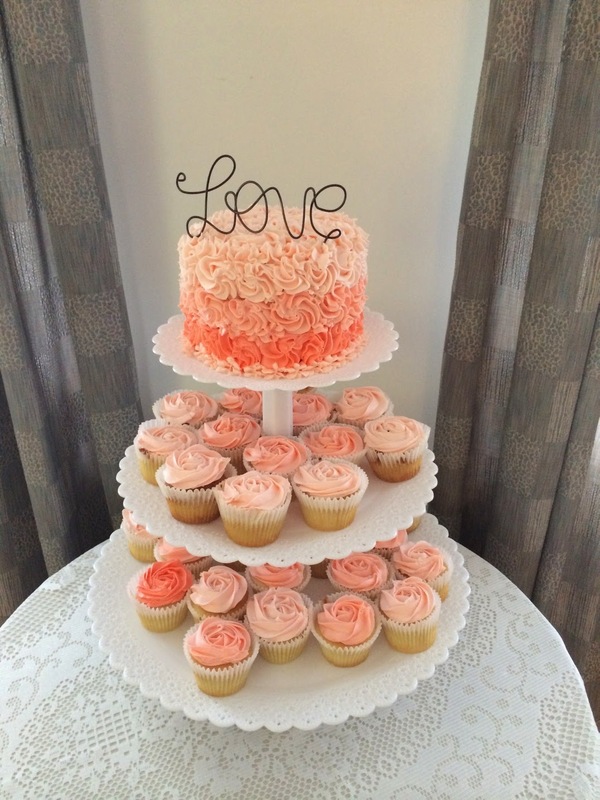 She chose a nice ombre style of decoration using a coral color icing. 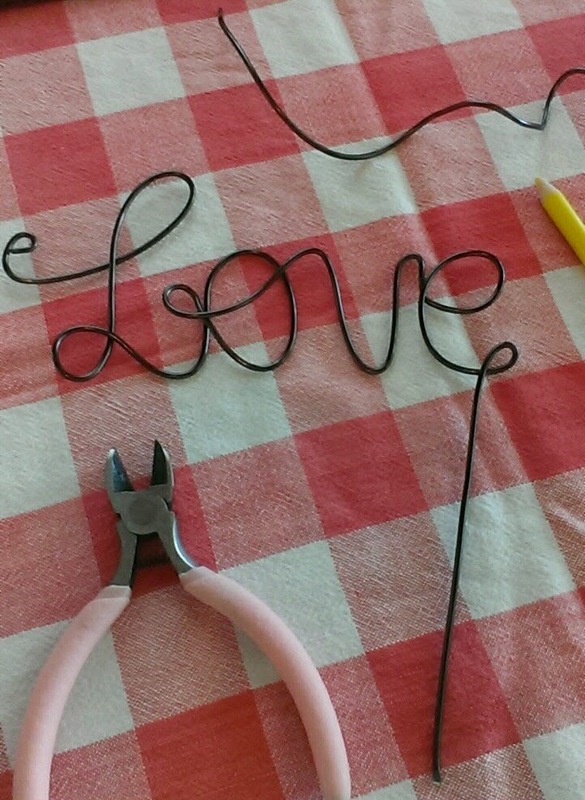 My husband assisted me in making the "Love" cake topper at the cottage earlier this summer. Just the perfect accent to this frilly cake. Notice the time. Its 8am on the day of the wedding. duties. What would I have done without her help! My sister moves the cake to it's place of distinction. The "Love" topper needs to be added yet. 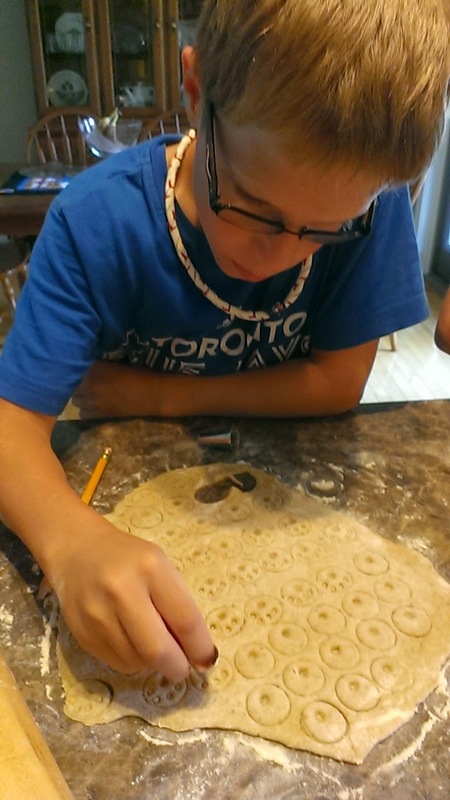 A wire project we made at the cottage. 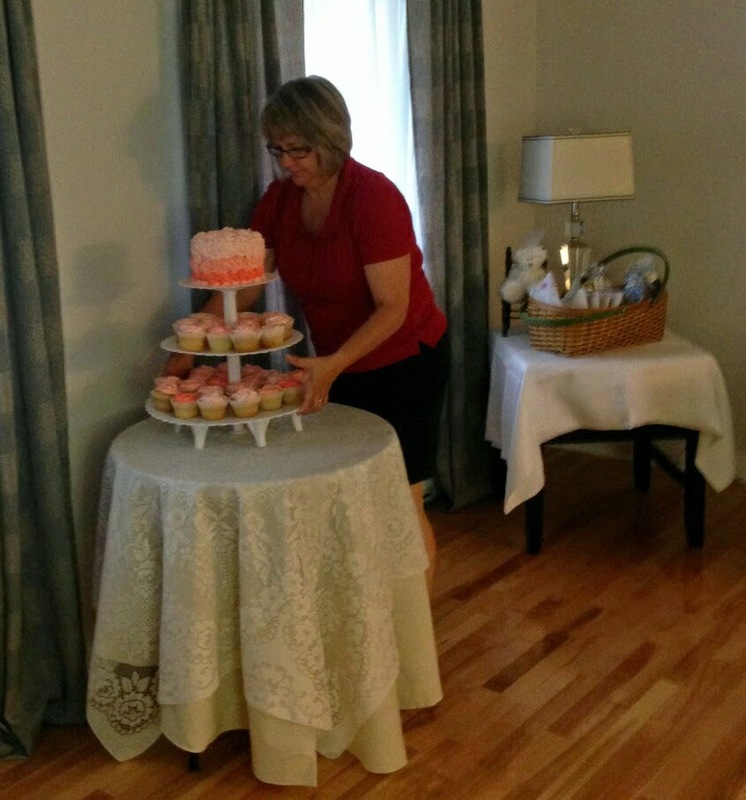 Jessica, our oldest grand-daughter said these cupcakes were the BEST cupcakes she's ever eaten. Well I thought I'd share the recipe that my sister gave me to use. It's like an artisan cupcake. Not light and fluffy like a cake mix cupcake. They were a wonderful home-made cupcake. Directions: Turn oven on to 375 degrees F.
This little wedding bear is not new. she was made when our middle daughter got married over 15 years ago. 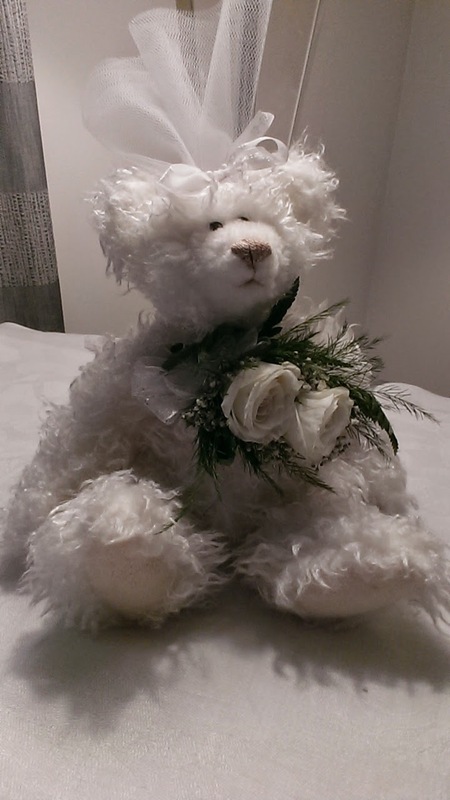 We made bears for the wedding party and used them for a decoration for her guestbook. Last week, when I was looking around for decorations for Patience's wedding, this white little bear was just perfect to sit on a table. She did not have a veil until I quickly whipped one up out of toule. At the end of the day, I was pleased to have a place to put my Mother of the Bride corsage. I just love this. 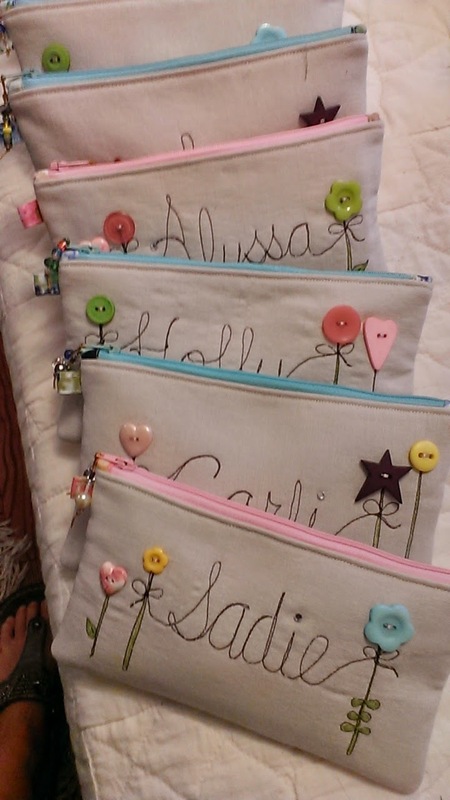 This fun little poem that goes with the traditional Jordan Almonds gift was fun to make with all my quilters tools. Just so you know, a bag of Wilton Jordon Almonds has about 120 almonds in it. This will make 24 little favors. is both bitter and sweet. children, and a long life! heat set a glue backed crystal. 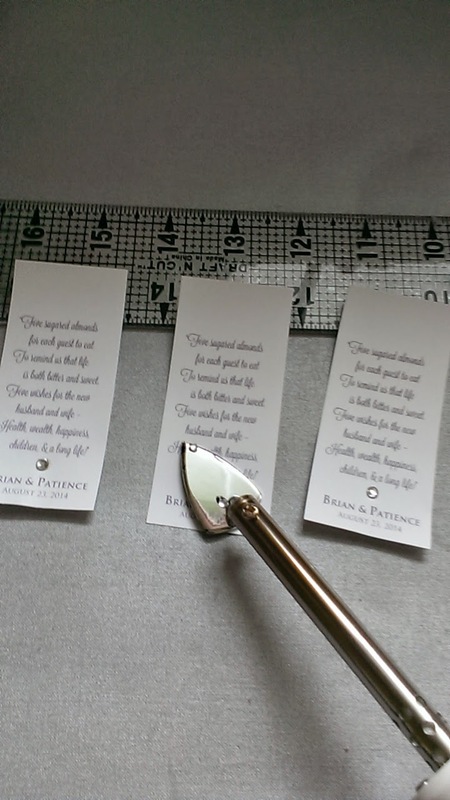 For Patience and Brian's wedding, I did do a few crafty things. 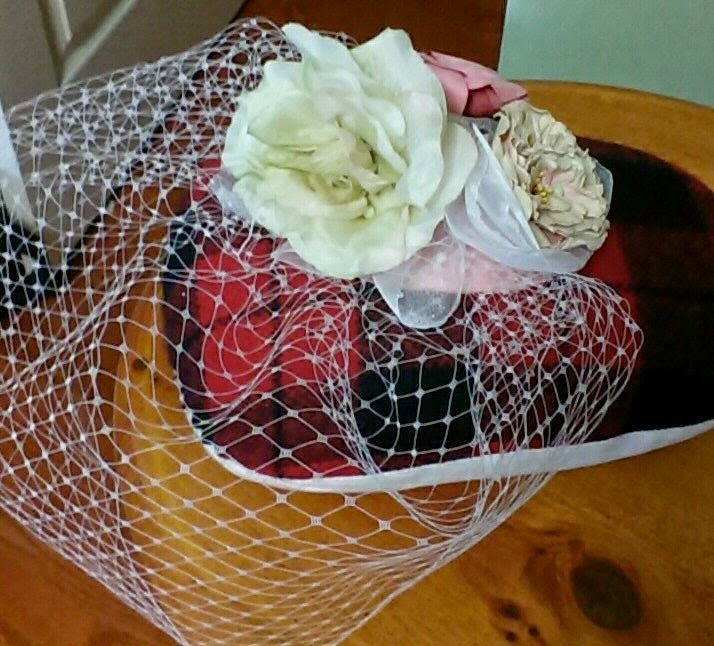 First and most important, I put together Patience's birdcage veil. We made it together. We did a mock up of the headpiece on my "ham". When we had it sorta perfect, I glue gunned it down to a felt base then trimmed. It was just sweet. We added a few crystals to give it a twinkle. When we get the photographers pictures next week, I'll show you how perfect it looked on Patience for her big day. Baby Phoebe was the youngest child. Since there was lots of kids coming to the wedding from the age of 2 months to 15 years, I thought I'd do a little something for the kids. 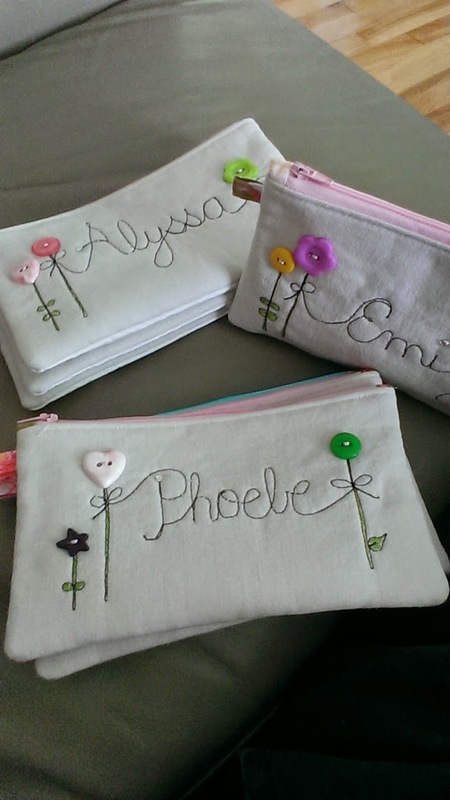 For the girls, these pencil case sized pouches were so girly and fun to make. You have seen me use this same pencil case idea here and here and here. I sketched out each of their names on the light muslin with my friXion pen. 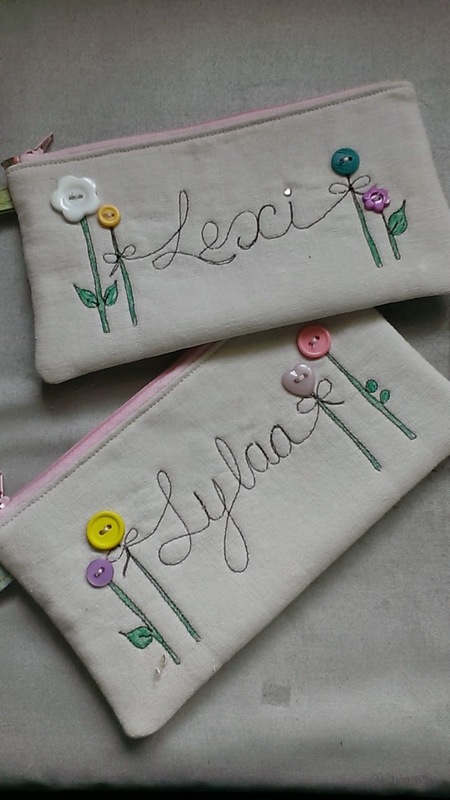 Then free-motion machine stitched over the flower stems and drafted names. Buttons from my collection for the flower heads were then machine sewn on. 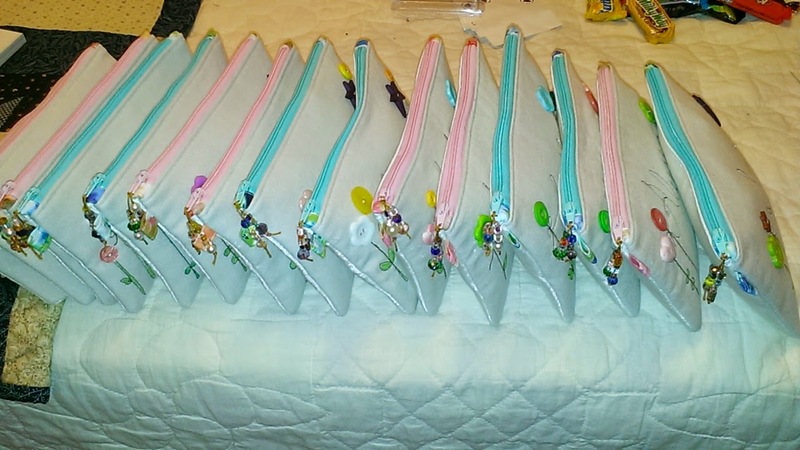 The pouches were filled with fun treats and given to the kids before they went home. I ran out of steam by the time it was time to make something for the little boys, so they got a nice cello bag with candy with dinky toys. 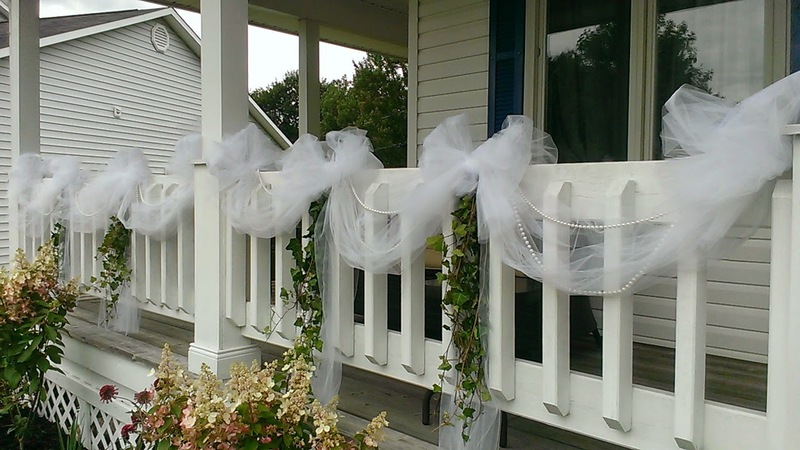 We had a beautiful wedding here over the weekend. It was really beautiful day is so many ways. I have no bride and groom pictures to share today and the professional photographer will get them to the bride and groom in all good time. But I do have a couple of pictures of yours truly taken by our grandson Mitchell who was operating a photobooth. It's almost wedding time. Our youngest daughter is getting married on August 23rd. 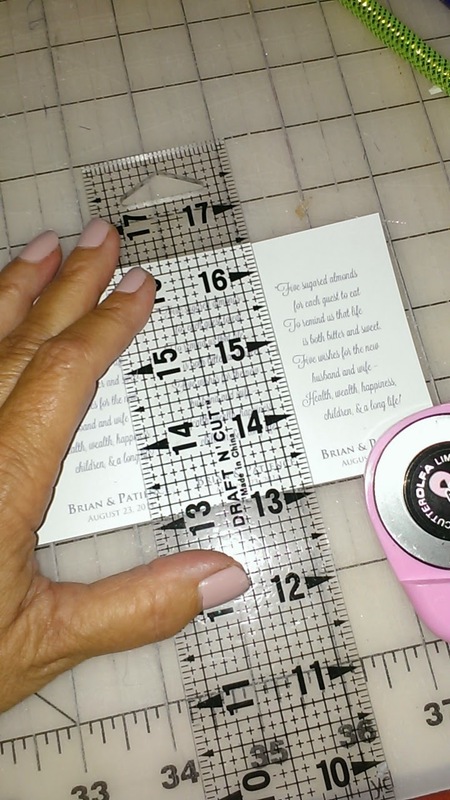 We've been working on some crafty things for this little wedding for a while now, but now it's crunch time. We are in the last 10 days and this week we'll be working on house decorations, food planning for our small at home reception. So, no blogging for the next little while. I'll be back after the wedding. We made up 4 packages to give to the dog friends of the kids. After talking about what dogs like to eat, we worked up the nerve to taste them. 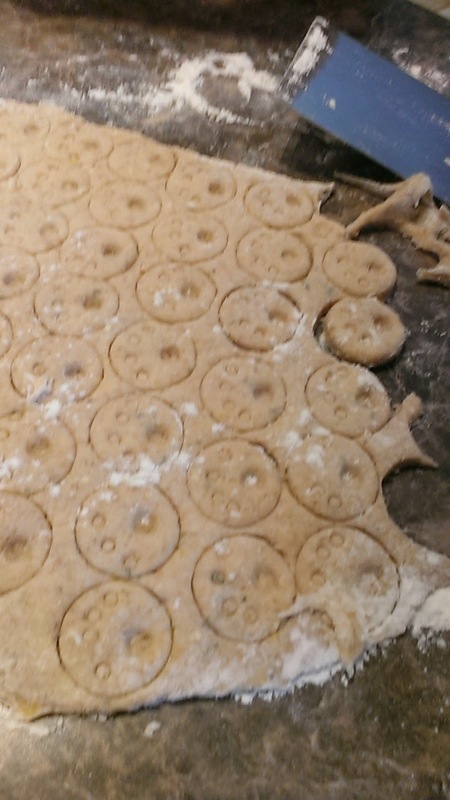 No sugar, butter or chocolate in them, so they were a little bland... Good for Dogs though!! I've been preparing to deliver a "test" Wallet class and we had the class earlier this week. The purpose of this test class was to figure out how long it takes to make the wallet in a class and what my traps as a teacher are. Well , 8 people took the class of varying skill level. We did it two mornings this week. Just look at the wallets. One person had to leave a bit early and didn't get it done, but I will help her finish soon. Just look at the beautiful wallets below. 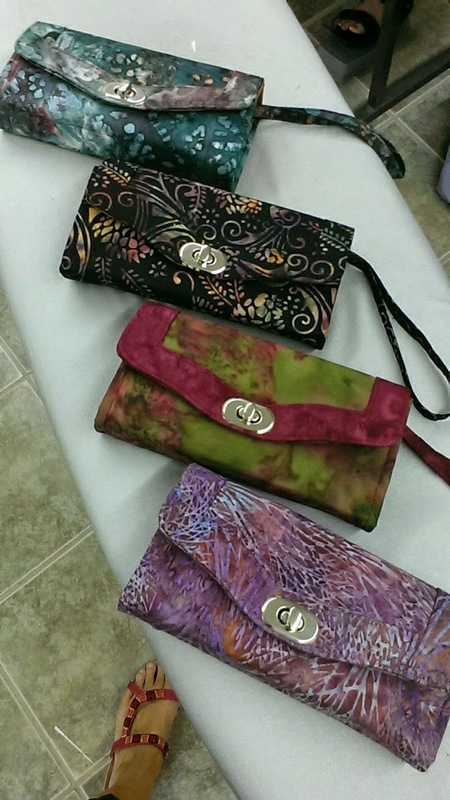 Jeannie Kaye's Wallet. The first one in the class done!! They are all so beautiful using batiks. 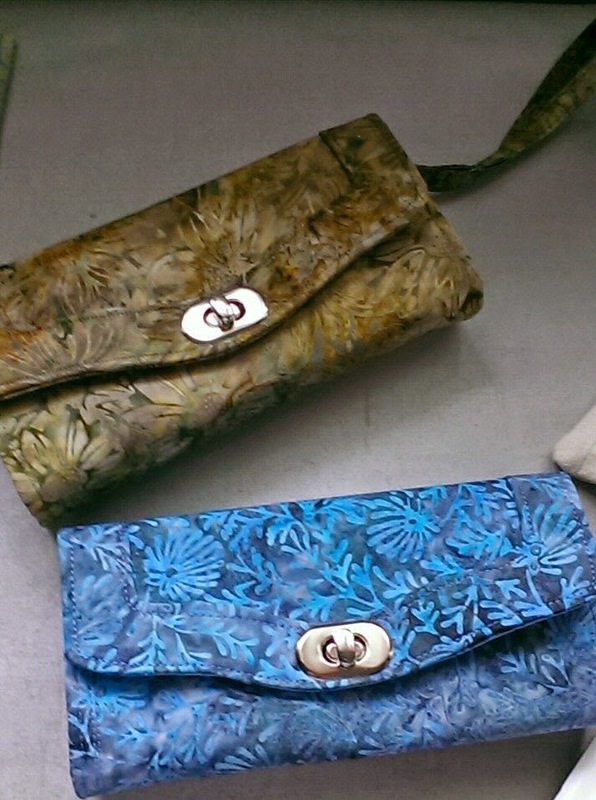 The metal finding and the extra top stitched piece on the flap give this a very professional look. Click on the picture to see Jeannie Kaye's fine top-stitching. 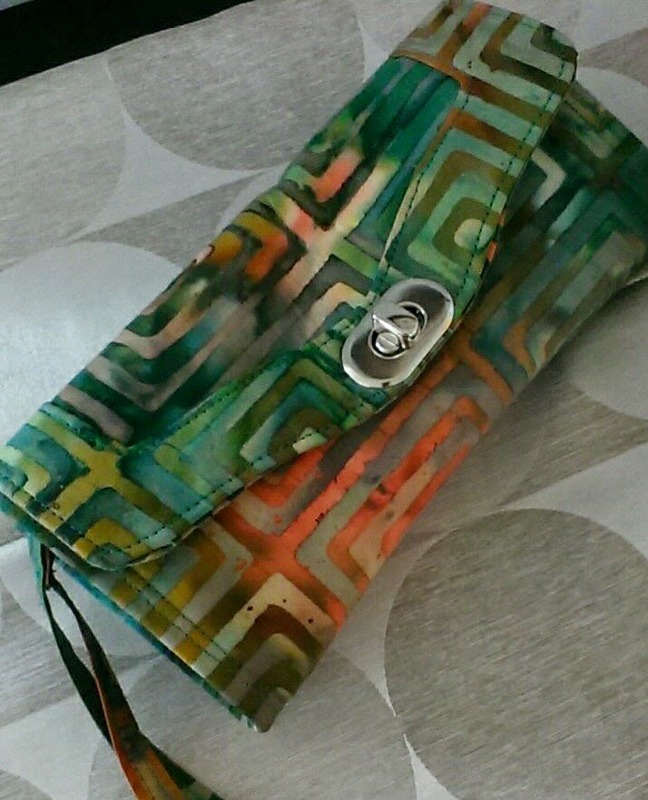 Look below at the nice idea Myrna had by putting the red frame around her wallet cover. Such a nice detail. She used fabrics from her stash, and was short on the outer fabric. How nice that she turned a bit of a problem into such a nice idea and option. Judy S.'s Wallet. Beautiful ! I'm pleased with how the wallets are very consistent. I really want to thank my tester students who spent the two mornings sewing with me and helped by giving me constructive feedback as we went along the class. This will make a smoother and more enjoyable class for my future students. So, I'm officially putting this class on my "to Teach" list. It is a class that has lots of fine detail but nothing too much.